We characterize the virtual link invariants that can be described as partition function of a real-valued R-matrix, by being weakly reflection positive. Weak reflection positivity is defined in terms of joining virtual link diagrams, which is a specialization of joining virtual link diagram tangles. Basic techniques are the first fundamental theorem of invariant theory, the Hanlon-Wales theorem on the decomposition of Brauer algebras, and the Procesi-Schwarz theorem on inequalities for closed orbits. Regts, G, Schrijver, A, & Sevenster, B. (2015). 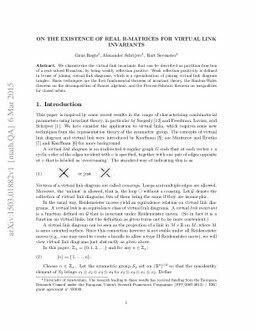 On the existence of real R-matrices for virtual link invariants. arXiv.org e-Print archive. Cornell University Library .